All The World's A Fomite: Where's your ilk, buttermilk? Used to come across recipes that required buttermilk, but could never find any in The Philippines or in Sweden. Ergo, when I spotted it in the store a few days ago, I just had to buy a bottle. 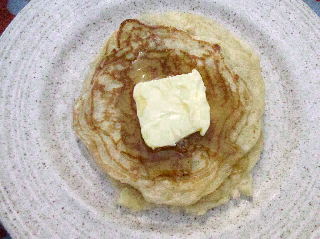 First up, buttermilk pancakes. While there is a difference in taste and texture compared to the non-buttermilk variety, I can't really say that one is better than the other. Next up, onion rings or buttermilk biscuits.